If I had to guess, I would say that my love of all things related to traditional cultures started in my grandparent’s living room. Our fairly frequent family gatherings would often involve some Scottish airs and folk songs, my grandfather on the fiddle. Sadly, us grandchildren didn’t learn the songs although I recognize most of the melodies (I started learning the violin with my daughters, and one of my goals is to learn those songs). One of my favourite memories is of listening and dancing to some jig or reel after a day of haying in the summer. 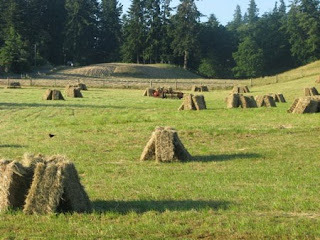 At that time haying was a family affair, involving many hands, lots of food, major itch caused by sweat mixing with hay seed, and rides in the back of a pick up on swaying piles of hay bales. Hay used to be made into square bales, which are actually rectangular, and they were leaned against each other like a pyramid so that if it rained the water would run off instead of soaking into the dry hay, like this. We still did it by hand, lifting and carrying each bale.